alaTest has collected and analyzed 36 reviews of LG OLED65E8 Series. The average rating for this product is 4.8/5, compared to an average rating of 4.6/5 for other products in the same category for all reviews. People really like the size and sound. The usability and image quality also get good comments. We analyzed user and expert ratings, product age and more factors. 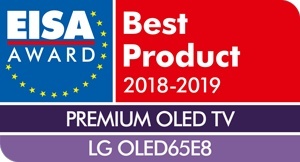 Compared to other products in the same category the LG OLED65E8 Series is awarded an overall alaScore™ of 96/100 = Excellent quality. Those extra inches make all the difference! 4K material on a large OLED screen is absolutely stunning. LG are the best. Easy to set up & packaging very intuitive to help unpack and assemble correctly. Moved from a high end (12 years ago) Pioneer Plasma TV which I thought still had a good picture until I turned this TV on.